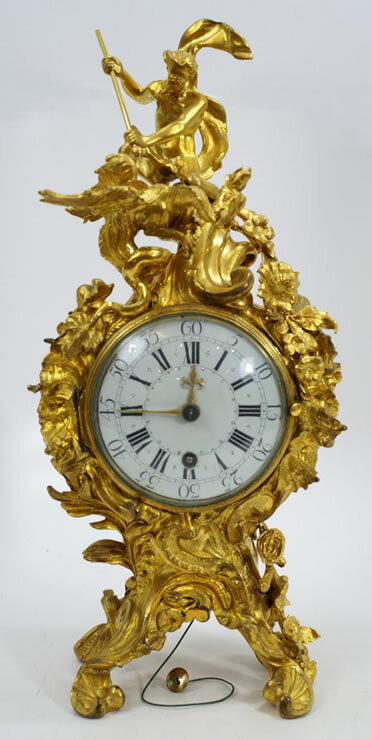 Louis XV ormoulu table clock with repeater movement by Pierre Le Roy. The asymmetrical rococo case is composed of scrolls, leaves, flowers and abstract rococo motifs executed in beautifully chased bronze doré with original gilding. The elaborate composition is surmounted by full relief figures of Perseus and the dragon. There are two glazed side openings to view the movement. The clock is elaborately decorated on the back and has a pierced ormoulu plate in front of the repeater movement signed Pierre LeRoy AParis.